Home > R35 > Changing the wheels on an 09 GT-R a no-no ? "Putting aftermarket rims on a GT-R is different story: Because of a sensor located near the valve stem in each wheel, it isn't possible for the car to run on aftermarket rims without throwing an error code. 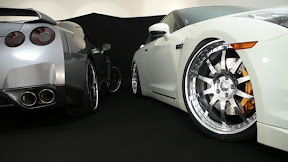 All blinged-out GT-Rs at Auto Salon got there on stockers and only then were the shoes changed."